LaCie rolls out the Little Big Disk with Thunderbolt, one of the first external storage solutions to feature the 10Gbps technology. Available in 1TB 7200RPM and 2TB 5400RPM editions, these disks will retail for $399 and $499, respectively. Additionally, a SSD model will follow in October. Today LaCie announced the Little Big Disk Thunderbolt Series is now available for purchase. It is the first portable solution to feature the shocking 10Gb/s speeds of Thunderbolt technology. This next-generation Little Big Disk is the first product in LaCie's series of high-end Thunderbolt solutions. Designed for the most demanding applications, the LaCie Little Big Disk Thunderbolt Series will bring a new level of performance to creative workflows and professional storage users. It offers ultra-fast data transfers, complete system backup in minutes, and faster content editing than ever before. "Performance can come in small packages," says Jason Ziller, Intel's director of Thunderbolt Marketing. "LaCie's Little Big Disk with Intel's Thunderbolt™ technology delivers blazingly fast transfer speeds in a truly portable form factor; we think media creators and entertainment enthusiasts alike are going to love it." The LaCie Little Big Disk Thunderbolt Series sets the new standard for the storage industry. Featuring a pair of 2.5" drives in a Mac OS RAID configuration, the Little Big Disk delivers stunning read speeds more than 480MB/s in SSD and up to 190MB/s in HDD. The more Little Big Disks you chain together, the more impressive the performance. Users can daisy chain several Little Big Disks to maximize the interface's capabilities and reach transfer rates around 800MB/s — truly rackmount storage speeds in a portable solution. A game changer for content creators and professional users, the Little Big Disk is the ultimate portable solution for fast access to data or on-set editing. It supports multiple RAID levels (0,1 and JBOD) and daisy chaining for storage expansion or connecting other peripherals. Additionally, it features a heat sink casing and quiet fan for dual cooling. "The great thing about the LaCie Little Big Disk Thunderbolt Series is its versatility," said Erwan Girard, Professional Business Unit Manager, LaCie. "No matter which Little Big Disk model you choose, it will serve your most demanding applications with ease and portability. It's the ultimate in storage technology." For more than 20 years, LaCie has worked in the Apple™ marketplace, introducing innovative products and launching cutting-edge technologies. LaCie developed the first Apple branded storage solution and showcased the first implementations of FireWire technology. Since then, LaCie has collaborated with Intel™ and Apple to develop a range of professional storage solutions featuring Thunderbolt technology. 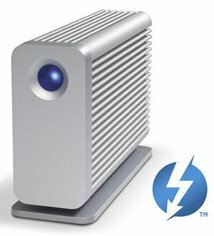 The LaCie Little Big Disk Thunderbolt Series HDD models are available through Apple retail stores worldwide and Apple.com. The SSD model will be shipping this October.